Khan Academy Kids launched this week. In collaboration with experts from the Stanford Graduate School of Education and children’s book authors, and in partnership with Super Simple Songs, Bellwether Media and National Geographic Magazine, the new app is designed to inspire a lifetime of learning and discovery with our free, fun educational program for children ages two through five. Together, parents and little ones will discover engaging curricular content, a library of interactive books to teach early academic skills, as well as a focus on social-emotional development and healthy habits. Available free in the App Store, and in beta for Google Play and the Amazon Appstore, Kahn Academy Kids, offers thousands of opportunities for learning as animated animals guide children to original, leveled and adaptive activities, books, video, and lessons. And as they interact, children collect bugs, hats, and toys for their new animal buddies. The Library is packed with content, offering books focused on Reading Foundational Skills–including rhyming, syllables, sounds, word families, book structure, and words in signs. Individual books introduce letters and their sounds. Additional titles introduce concepts in writing and language. The Nonfiction section includes animals and vehicles and leveled readers and there are also Young Explorer titles from National Geographic. 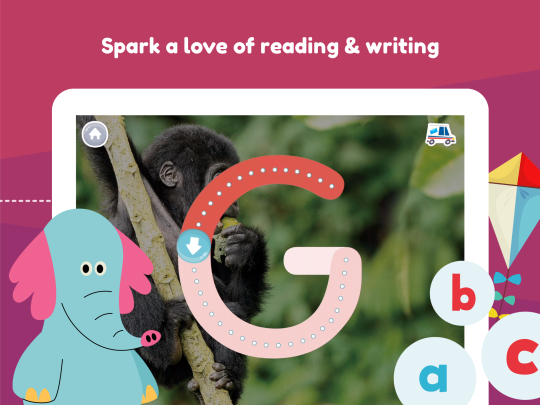 Children may choose to have the app read them books or to read selected books independently. Mathematical concepts introduced include counting, comparing numbers and shapes and measurement. Among the logic activities are Focus, Memory and Flexible Thinking, Patterns and Shapes. Videos in the Library area include Super Simple Songs (with such faves as Old MacDonald, If You’re Happy and Apples and Bananas); Counting, Shapes, and Measurement; Reading and Language and Letters. The Library also offers children opportunities to draw, color, record their narrations and archive their creative work in a Gallery. The app’s interdisciplinary experiences align with Head Start’s Early Learning Outcomes Framework and Common Core Kindergarten Standards. Parents can set up accounts for multiple children and they are encouraged to view their children’s progress. Please share Kahn Academy Kids with your friends in early education and with the pre-school and kindergarten parents you know!